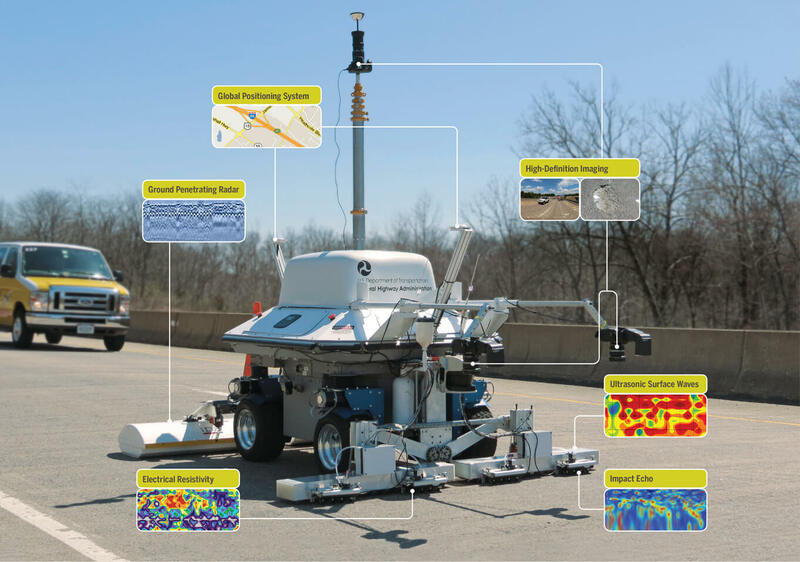 RABIT™ is the first fully automated robotic device for making comprehensive condition assessments of concrete bridge decks based on quantitative data. It is a fast, safe, and thorough tool to help bridge owners make data-driven maintenance and repair decisions that extend the service life of vital infrastructure. In 2011, FHWA Administrator Victor Mendez challenged his agency’s Long-Term Bridge Performance (LTBP) Program and CAIT to develop a system that would enhance and streamline condition assessment of the nation’s bridge inventory. The team conceptualized a way to deploy multiple NDE tools that have proven effective for detecting and characterizing the biggest culprits in bridge deck degradation: corrosion, delamination, and concrete quality. Automation was a must for systematic data collection that can be done faster than manual NDE methods, but without compromising data integrity or resolution. Data points are linked with their exact GPS location, the data from all the NDE tools is merged, and an easy-to-interpret, comprehensive picture of deck condition—inside and out—is output. RABIT also is safe, efficient, and easy to operate. Since 2012, the team has been refining RABIT™ and validating its performance in the field. To date, it has inspected about 1.2 million square feet of bridge decks in Delaware, Illinois, Maryland, New Jersey, Pennsylvania, and Virginia for clients such as the New Jersey Turnpike Authority, Michael Baker Corporation, USDOT, and state DOTs. The process of commercializing is underway so RABIT™ will be available to transportation agencies across the country. RABIT is faster, simpler, and safer than deploying individual NDE tools and technicians. 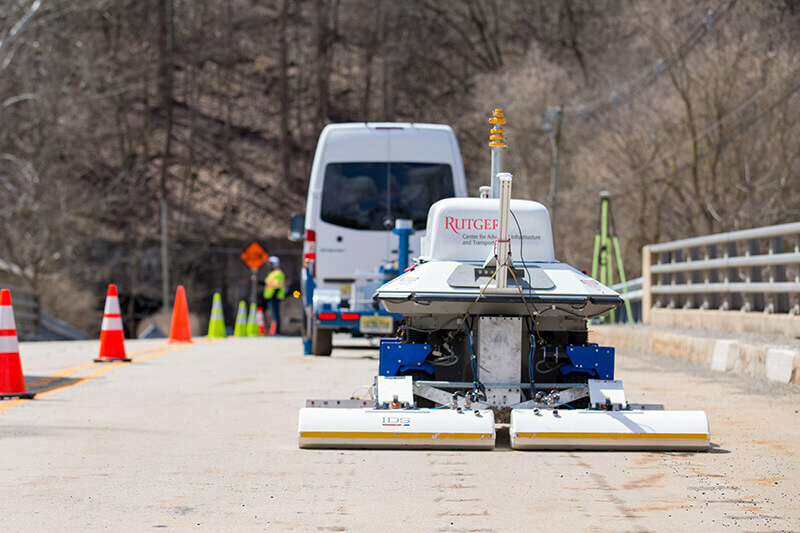 The robot can detect cracks and other anomalies before they appear on the surface, making it possible to intervene before small issues become big ones. RABIT also reduces lane closures that can inconvenience drivers. Photo: ©Drew Noel Photography/Rutgers CAIT. Global Positioning System records and tags all data gathered with exact position coordinates and orients/guides the robot. Ground Penetrating Radar is used to detect suspected flaws or characterize apparent deterioration. High-Definition Imaging captures detailed images of the deck surface and 360-degree views of bridge features. Ultrasonic Surface Waves assess the quality and modulus of elasticity, indicators of the strength of the concrete deck. Impact Echo detects and characterizes delamination (horizontal cracking) with respect to depth, spread, and severity. Electrical Resistivity diagnoses the severity of the corrosive environment. Provides comprehensive condition assessment of concrete bridge decks. RABIT™ uses high-resolution imaging and multiple NDE tools simultaneously to gather and geotag quantitative data on areas of delamination, corrosion, and degradation as well as surface conditions. Simplifies operation, data presentation, and analysis. RABIT™ is easy to set up, operates autonomously, and automates the majority of data analysis. Its custom data integration and visualization modules provide an intuitive, comprehensive picture of all critical deterioration features. Improves speed of data collection and analysis. Because RABIT™ deploys multiple tools simultaneously, it gathers data four times faster than individual NDE tools. It is transported in a vehicle that serves as a mobile command center in which real-time data transmitted wirelessly from the robot is processed and compiled by on-board computers and displayed as clear visualizations of deck condition. Crack maps, surface images, and NDE data can be analyzed on the spot. Saves time and money. RABIT™ significantly reduces the cost of comprehensive bridge deck inspections. It increases productivity, reduces the number of field technicians needed on site, and lessens traffic disruptions that can inconvenience drivers and businesses. Improves safety for inspectors and motorists. With faster data collection, shorter lane closures, and fewer technicians on the bridge, RABIT™ minimizes workers’ and drivers’ exposure to the risks inherent in roadway work zones. Minimizes negative environmental impacts. RABIT™ runs on clean, rechargeable batteries. It also alleviates work zone congestion and resulting traffic emissions.